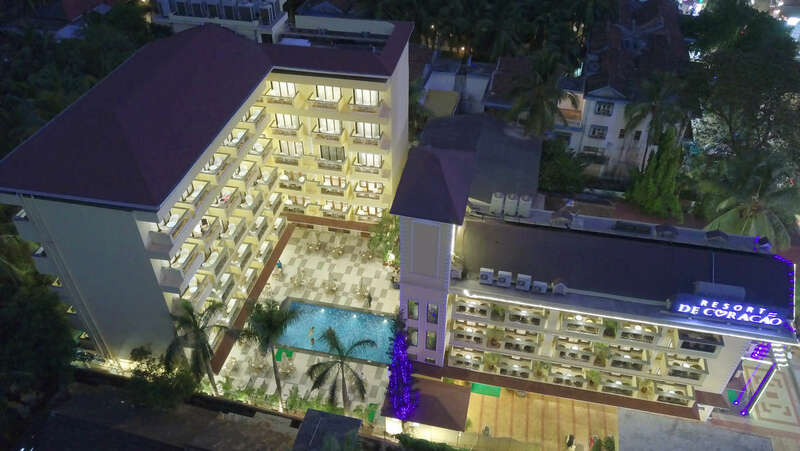 Located at Calangute – Candolim Main Road, just 500 meters away from the Princess of Beaches Calangute, isResort De Coracao - Goa beach resort. It is close to the famous Candolim & Baga Beaches too. Pampering guests with a traditional warm Indian hospitality, contemporary design, and modern touch, we are one of the best resorts in Goa. Situated in the wonderful town of Goa, you are definitely in for an adventurous experience with our immaculate services. Filled with comfort, convenience and a state of the art set of amenities, we offer a wide range of elegant rooms like Superior Rooms, Deluxe Rooms, Super Deluxe Rooms, Premium Rooms, and Suites. Avail spacious Guest Rooms and unmatched services from our experienced, professional and friendly staff. These rooms are inclusive of an attached bath, elegant décor and lovely ambience that meet all the needs and expectations of all our guests. Our goa beach resort offers a range of well-appointed rooms with ample amenities and exceptional facilities. Our in-house restaurant Ice and Spice serves up some of the best dishes in Calangute. Be it seafood, Indian or any other cuisine, you will surely have a ravishing meal. Offerings a gastronomical adventure at these restaurants is one of the best beach resorts in Goa, Resort De Coração. Celebrate or host any form of functions at our banquet hall - Waves, which set with absolute quaint interiors and comes packed with all sorts of equipment. Book a stay with our endearing services and get a wide range of hotel amenities that will make your stay a memorable one. Surfeit of fun - Goa!